In December of the mid-war year of 1942 there was a singularly interesting chess event - as much for its political dimension as for its chess. It looks like it might have been the brainchild of William Winter, British Champion in 1935 and 1936, who was a Communist (read all about him here), and it was reported by Winter himself in Chess of February 1943: it was a 20 board match between the British Workers' Sports Association representing British Trade Unionists, and the "Continental Workers", from the combined Refugee Associations (detail from Chess February 1943, and BCM Jan 43), held at the Trade Union Club, London, on Sunday 13th December. Speeches of welcome were given by, among others, Mr J. Middleton, Secretary of the Labour Party, and Mr T.O'Brien, representing the General Council of the Trades Union Congress. War Memorial (1956) by Jacob Epstein. In the courtyard of the TUC's Congress House, London. 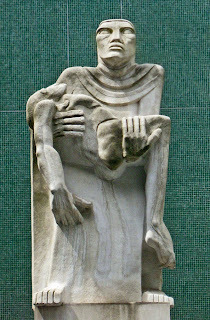 It is a memorial to trade unionists who lost their lives in both world wars. Winter (board 1 for the British TUs) and Heinrich Fraenkel (bd 2 for the visitors, from Germany) replied, and the former "was able to quote [figures] showing the popularity of chess in the Soviet Union [which] seemed to come as an eye opener to some of the visitors." Dr. Stefan Fazekas (Czecho-slovakia), who domiciled here and was to be British Champion in 1957, beat Winter. The General Secretary of the International Federation of Trade Unions, W. Schevenel, beat Lewis Silkin, Labour MP for Peckham, on board 10. J.D. Solomon (active in Hampstead CC, and referred to by Richard James in the comment box to the last episode but one; from the Musician's Union said the BCM) drew on board 3. The home team was "rather badly beaten" 6.5 v 13.5. The geo-political-military situation explains a lot. "The German invasion of the Soviet Union in June 1941...prompted the government to send a flow of supplies and armament [to them]. The TUC assisted this through its 'Help for Russia' fund and maintained close contact with Soviet trade unions through the Anglo-Russian Trade Union Council established in 1941. Until the end of the war, the anti-communism which had been the hallmark of the TUC leadership since 1926 was temporarily abandoned." (From here). The Workers' Sports Association, said Winter, is "determined to make this match the forerunner of many other activities. The next project is a Workers' team tournament on the lines of the great Chess Olympiads of peace-time." 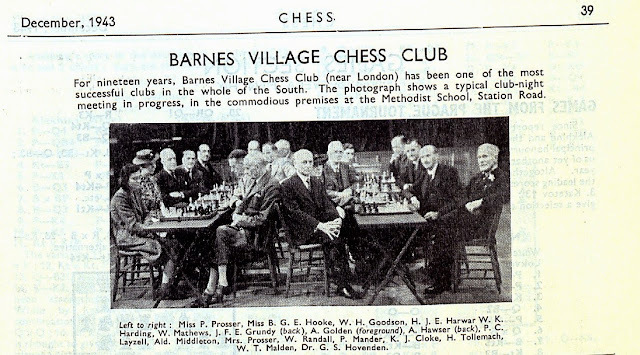 Winter had been involved with the Workers' Chess League, which the BCM had reported back in August 1938 (referring also to him writing in the Daily Worker). It had had a team in the London League 'C' Division in the pre-war '39 season, and its "official organ" was the magazine Time and Space, running from 1938 to 1940. It held a small lightning tournament in October 42 (Winter, Klein and Cross, the top three - BCM Nov 42), and a proper tournament in early 1943 (Lister, Solomon, Cross, the top three this time), at Bermondsey Town Hall. The BCM gave the game below from the tournament: "Mr Winter is to be congratulated for producing, as Black and in a closed defence, a game of such exceptional brilliance." These references to the entrance of the Soviet Union into the war, and its significant part in rolling back the German Army, projects this story of British war-time chess forward towards the end of the conflict in 1945. Previous episodes recorded the Forces championships in 1943 and 1944, and the pages of the chess magazines also convey the impression of expanding civilian chess activities in the later years. As these posts cannot cover them all, we'll concentrate on inter-county chess. In 1943 we see the emergence of friendly county matches. "There have yet been few" said the BCM in Jan 1943, mentioning Nottinghamshire and Leicestershire (who also played again in May 43), and Essex and Kent. And here the County Counting starts again as the SCCA Match Books record these stirrings of county chess in the home counties. There were friendlies between Surrey and Kent on 31 July 1943, and Surrey v Middlesex on 28th August 1943, both played at Battersea CC's home venue, the Railway Tavern, Battersea Rise. They were also reported in the BCM of October 1943. The team list for the Surrey v Kent match is given in the Appendix, together with the pre-war club afffilation of the Surrey players. Putting the boot into Jerry. ...transport is if anything worse, and all year round there are additional duties, Home Guard, Fire Guard, filling in forms, etc., etc." "In criticising those who do nothing at all, we are apt to overlook the splendid achievements of those who do so much. (In this case, we believe, Messrs. C. Boyce, H. Meek, J. van Meurs, Owen Dixson and last but not least G.J.Craddock.)" The BCM reports an Essex v Surrey match at the same venue on June 19th 1943 (although it doesn't appear in the SCCA Match Book), noting again the "considerable difficulty to get teams of twenty together, with so many men in the Forces, Civil Defence, or evacuated to the country...seeing that there were no defaults in spite of the long journey it was a task well done". Just going back to the Surrey v Kent match for a moment let's note that a number of ladies were playing for Kent, including a Mrs Beaufoy on board 20 (losing to van Meurs, defender of the BCF in the last episode), Mrs Olga Rubery (Vera Menchik's sister, winning on 10), Elaine Saunders (1939 British Ladies Champion, losing on 7), and the ill-fated Vera Menchik who drew on board 1. Here we can record the tragic loss of the Menchik sisters, and their mother, when a VI rocket fell on their home in Clapham on 27 June 1944. "British Chess has suffered a grievous and irreparable loss" said the BCM in August 1944. "No word could adequately express the sorrow of chess-players everywhere", wrote Owen Dixson at the end of the war. 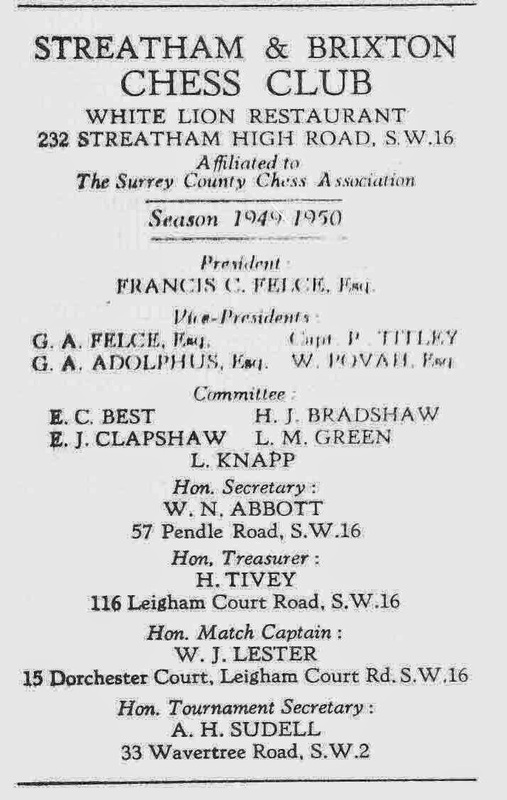 The friendly county matches of 1943 appear as a kind of warm-up for a Southern Counties Chess Union war-time competition, for which the venue for many of the matches was St. Bride's: "a happy re-union" said the BCM in November '44. As Owen Dixson reported, on behalf of the SCCU in the BCF Year Book for 1946-47: "the enthusiasm of Kent players - despite much heavy bombing - enabled wartime tournaments, a week's congress [Sidcup, 10th-15th August 1942 - MS] and various inter-county matches of a scratch nature to be organised." They were the spring-board for the SCCU Inter-County Tournament of 1944. "Mr. J.H. Van Meurs, who made all arrangements for matches to be held at St. Bride's and for the necessary refreshments, despite an assortment of V1's and V2's which were liable to arrive on the scene without warning an upset the best-laid plans." 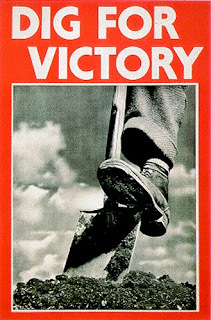 Surrey beat Kent 12-8 on 11 November 1944 to clinch victory overall. Here is the final table from the BCM. Surrey did it again in 1945, beating Middlesex 11.5 v 8.5 on July 7th, "thus winning the competition" as a note in the SCCA Match Book proudly proclaimed. 1944 had also seen an individual championship, in knockout format, for the Southern Counties Union with 32 entries. It was won by H.Brown (of Surrey, and pre-war Brixton, and Clapham Common CCs), though it was marred by the untimely death of Vera Menchik at the semi-final stage; and let's also note the Surrey v Essex match of 11 March 1944 - if only because on board 20 one L.W.Barden appears (drawing against F.W.Davis). He appears also in the same issue of the BCM as the table above, albeit with the indignity of a typo: S. (sic) W. Barden. He played - and drew - on board 13 for Croydon CC in an away match v West London (who won 11.5 v 7.5). "Much interest was shown in the game" reported the B.C.M. where the winner of the "Croydon boys' championship last year held his own in a tough game against a seasoned opponent." He had won it at Christmas 1943, "he is [in Feb 44] only 14 and put up a very fine performance with 9 straight wins". Long live Leonard! 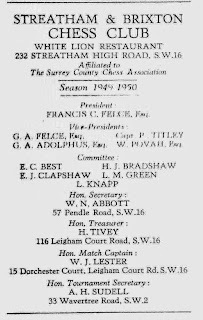 Croydon CC, re-formed in 1942, was one of the 11 clubs that were affiliated in the first post-war season to the Surrey County Chess Association according to its 1945-6 report (BCF Year Book 1946-7), and the only one, said the report, to increase its memberhip over the war years. Morden, as was noted in War Game 4, was actually formed during the war by L. C. Birch (of pre-war Battersea CC, "a universally popular player" (Chess Nov 43) but tragically killed on active service in Africa), and it is possible to trace the continuing activity of some others throughout the war years: certainly Battersea, Guildford (which had a special mention in the BCM in 1942 for "having just held its 44th AGM") and Kingston. The picture, below, of Barnes Village CC in action sometime in 1943 is rather charming, especially for the snap of Phyllis Prosser over to the left, ignoring the camera in favour of her game. She had been the British Girls' Champion in 1939. 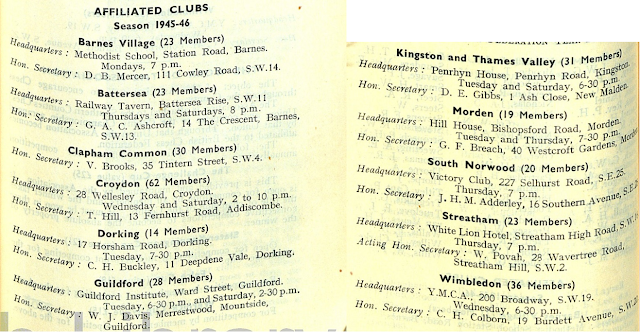 Other clubs in the list above are familiar from the pre-war landscape; but some, in 45-46, were "unfortunately still dormant, notably Brixton, Sutton and Wallington, and it is hoped that former members of these clubs will make every effort to revive them." (SCCA report in BCF Year Book 1945-6). The last two did revive (Sutton in April 1948 according to David Parsons' History of Chess in Sutton). Brixton alas didn't. Its immediate pre-war membership was of "mature age" (said C.E.Williams later in a Knightmare! history of the club) and it was beyond resuscitation, especially as one of its senior figures - and SCCU and SCCA President - Dr. F.St.J.Steadman passed away in April 43 (also here). Brixton, or what could be found of it, amalgamated with Streatham in 1946. As for Streatham itself: "during the war they gave up their weekly meetings [at the White Lion - MS], although some of them were to be seen daily at a certain well-known cafe "battling" with each other over a tea table" (Undated press cutting reproduced in Knightmare! - and pretty typical one would think). It first re-appeared in the London League in Autumn of 1946 as "Streatham and Brixton". So, on that domestic note, this series concludes. It has been somewhat selective and impressionistic. A definitive history of chess in Britain during the second war has yet to be written; should anyone feel so inclined, that is. After all, it is a mere footnote in the main drama of the war, although there is a good deal more to it than might be supposed; and that's whatever the role was, or was not, of the BCF. It would make a good case study of the challenges and achievements of "business as usual". During the war years some clubs and County Associations suspended operations, some clubs never recovered, and a good number soldiered on throughout. There was a fair amount of civilian chess activity, with even some new outfits appearing, often interacting with Forces' chess. This had a life of its own, too, of course, and chess had many new recruits in the Services; but in reality its leading lights were already playing on civvy street before the war started. The civilian chess community saw many casualties during the war years: clubs, and individuals too; with several tragic deaths, both in and out of uniform, due to the conflict. After the earlier series on chess in WW1, a couple of posts on the aftermath of the Spanish Civil War, and now this series on WW2, perhaps we have had enough of the business of chess and war. There are, however, one or two loose ends to tie up from WW2, so we may return to it yet. David Parsons (1998) History of Chess in Sutton and Surrey. 31st July 1943 at Railway Tavern, Battersea Rise. Note that club affiliations are pre-war; with thanks to Martin Cath. Thanks for this series of blogs, I (for one) have found them fascinating. What follows is not directly relevant to what you have written (although there is a connection to WW2) , but I learned chess from a book loaned from Grays public library in the early 1960s. It was a beginners' book written by a British prisoner of war who wrote about his experience of the POW camp as well as teaching chess. When I borrowed my second book ("Modern Chess Strategy" by Edward Lasker) I discovered that a fair part of the advice given in the first book (particularly on openings) was unreliable. Anyway, for nostalgic reasons, I have been looking for the first book for the last 20 years, hampered by the fact that I can remember neither the title of the first book nor its author. Perhaps a reader of these blogs may know the book I am writing about? So pleased you enjoyed the series, Mike. I hope some reader of the blog might help you track down your book.